In the ever-popular TV comedy, The Big Bang Theory, Sheldon Cooper is a mastermind at creating agreements. His Relationship Agreement and Roommate Agreement contain many clauses and cohabitation riders. As far-fetched as Sheldon’s agreements appear, they validate their importance when things go off course. Conflict resolution skills are just as important in a family business as they are for any workplace environment. When people work together in close proximity, their personalities and temperaments are bound to clash over both general and specific issues. 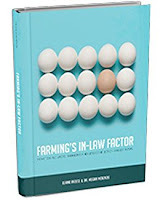 The notion of creating a Standard Operating Procedure (SOP) to resolve conflicts within a family business may sound odd but think for a second of the benefits. 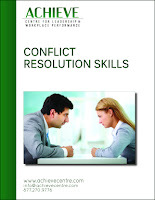 A Conflict Resolution SOP can provide clarity when confusion and chaos break out as a result of disagreement. 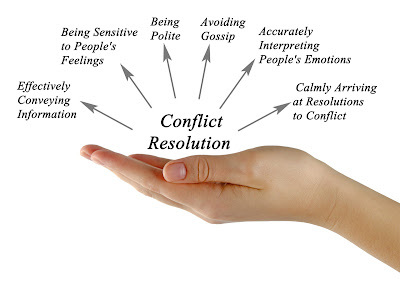 Learning how to deal with conflicts should be on our how-to-do list. Conflict will undoubtedly occur in both our personal and business affairs. When the combine or tractor breaks down, an operating manual shows us how to fix the problem. When communication breaks down over an important issue, the SOP can provide a similar fix. 1. 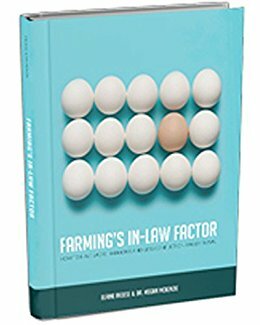 The best way to devise a “Conflict Resolution Policy” is to include every member of the family business into its creation. Begin with an attitude and vision that all family members will understand and accept this document as an important guide for settling conflicts. 2. Record the events as they occurred to determine the conflict issues that triggered either the positive or negative results. You are building a framework for action steps to deal effectively with future conflicts. 3. The wording in your document should include strong positive language that addresses appropriate and acceptable behavior. The notion of being respectful at all times and attacking the problem not the person may need to be included. 4. The time limit for resolving issues should be pre-determined. Some issues may need to wait to allow for tempers to cool down; other issues may require an immediate response. 5. The guidelines should specify acceptable practices such as: deal directly with the person involved in the issue; vow to keep the issue private among concerned individuals rather than publicize the problem; and be vigilant to uncover the “real” issue. 6. The protocol for involving an outside mediator should be detailed with respect to the circumstances and timelines. It’s easy to get stuck in the routine of always doing things a certain way. Unknowingly, this certain way can evolve into “the only way”. I was put in this situation with my father-in-law. He was determined that my husband’s way was not the way he would do things. In no uncertain terms he was out to prove a point. Our relationship was put through a stress-test as we battled through how the cattle would be fed. I will always remember the lesson about “The Way”. Small petty disagreements can erupt over the way things should be or could be handled, fixed, repaired, built, marketed, delegated, managed, improved, planted, harvested, or sprayed. All these discussions and decisions need to be worked through in a respectful way. That’s the only way. If you are interesting in learning more about conflict resolution skills, I recommend checking Achieve Training Centre’s website. Click here to see their list of manuals created and intended for personal use. The Conflict Resolution Skills manual provides pointers for being “Tenants of a Respectful Workplace”, a list every family business may wish to adopt. Be positive in interactions with others. Be thoughtful about how you communicate and the words you use. Become aware of how your actions and words are being perceived. Remember that what offends one person may not offend another. Do you make the best use of your time? I believe if we were honest, our answer would be “No”. We all are guilty of squandering some time on tasks of less importance. Certain items on our to-do lists which desperately need our attention are continually pushed to the bottom of the list for a variety of reasons. 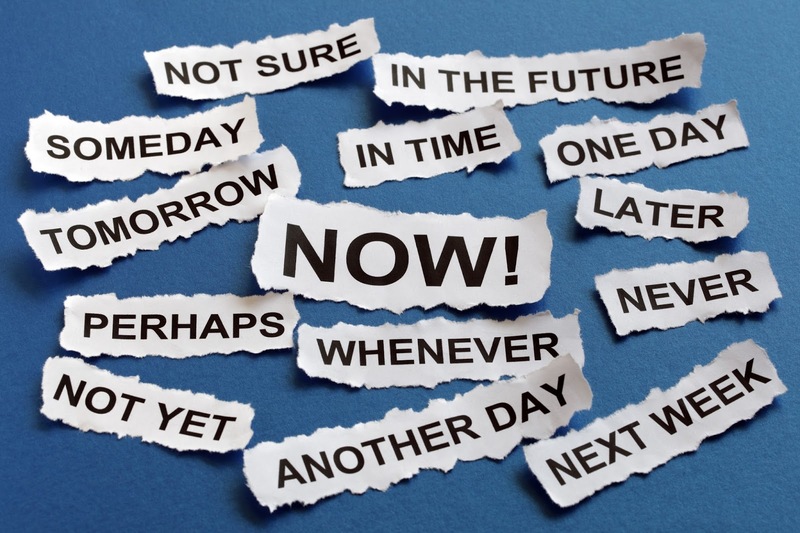 We vow we are not procrastinators simply because we’re always busy. So what’s up with that? 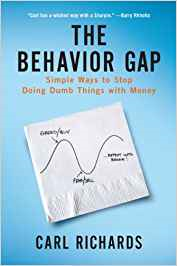 This excerpt from Carl Richard’s book, The Behavior Gap, is long-winded but worth the read. His explanation offers answers for why we have a tendency to complete less important tasks. “Some tasks are both urgent and important. They belong at the top of your list. 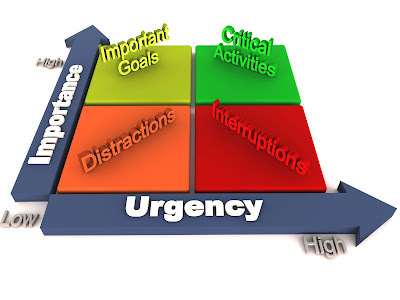 Some tasks are urgent but not so important; still others are important but not so urgent. 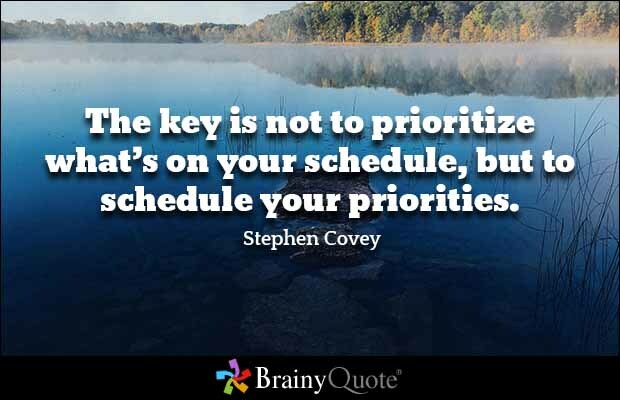 Typically, the ones that are urgent but not important get done. The phone gets answered. So does reading the Facebook posting from your high school classmate. Meanwhile, the tasks that are important but not urgent drop to the bottom of the list and stay there. This can cause big problems. Dreams are awfully important. But they often don’t seem urgent. And so our dreams fall to the bottom of our list. You might need to fix the car – that’s probably urgent, and might be pretty important. Shopping for a new surfboard? Probably feels urgent, but it’s not as important as some of the non-urgent stuff that will affect your family’s long-term security. (My surfer friends may disagree.) Clarifying who will take custody of your children if you die? Might not feel so urgent, but it can be awfully important. On a day-to-day basis it’s easier to focus on the urgent stuff, leaving non-urgent but important stuff to wait. Which would you do first: get the car washed or update your will? The car is really dirty! The will? What’s the rush? What’s more, updating your will – like buying life insurance or setting up college savings account – is a complicated process. Washing the car is easy. We also enjoy the sense of checking urgent (not always important) things off a list. Some urgent tasks (shopping for that surfboard!) are even fun. By comparison, sitting down and working through the details of your personal and financial lives may not seem to offer the same sense of excitement and immediate gratification (though it can). Did you discover why we have a tendency to complete less important tasks? Tasks which are fun, easy to do, or provide instant gratification are likely to get done before tasks which have a steep learning curve and are time consuming. While you need to have a to-do list to check off tasks, you also need to determine the order in which your tasks can be completed so you can make wise use of your time. Carl Richard’s reference resembles the time management concept presented in Stephen Covey’s book, The 7 Habits of Highly Effective People. When we examine our activities, we can break each into one of four quadrants, as illustrated in the above diagram. It is helpful to designate tasks as either “urgent” or “important”. 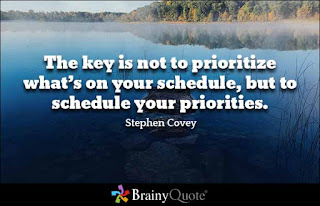 Stephen Covey defines “urgent” as the things which require your immediate attention and “important” as things having to do with results related to your mission, values, and high priority goals. Ideally, we want to be proactively working on the issues that are “important but not urgent” in order to prevent events from escalating to issues that will become both “important and urgent”. I would venture to guess that we know which tasks provide an everlasting effect on our personal and business financial health. What may slow us down is deciding which tasks should be completed first. I am in favor of finding the right tools (or worksheets) which can help get the job done. 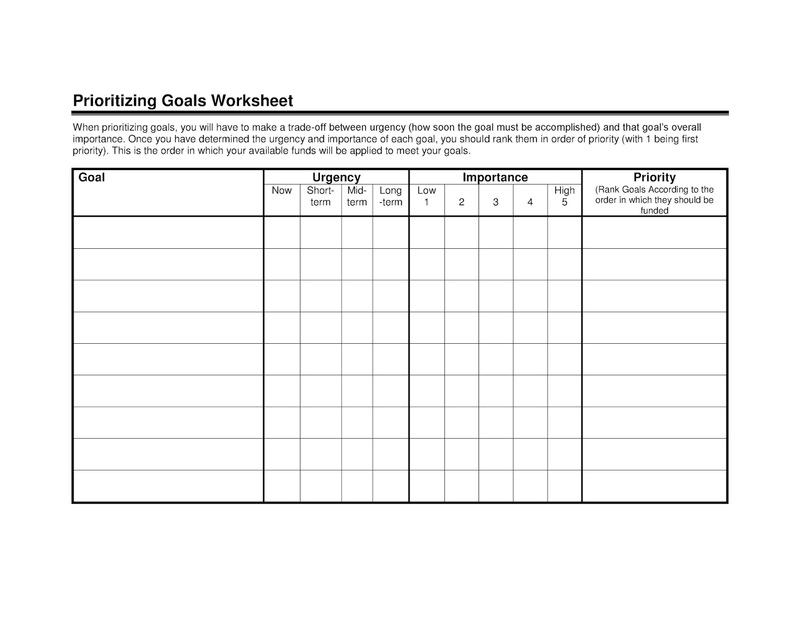 It’s helpful to have a visual picture like this worksheet to rank the goals in order of priority. 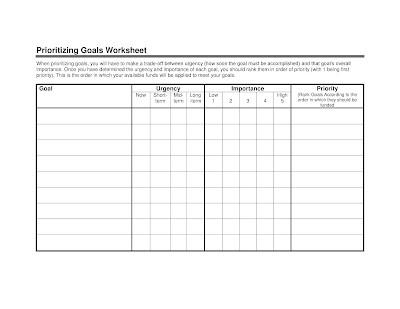 It also allows everyone to complete their individual worksheet and then arrange a joint meeting to discuss the order of goals in urgency and importance. We look at the calendar, see another day slip by, and quickly say “Good-bye” to another month. We know we’ve been busy but we’re never entirely sure what we’ve accomplished. Surely, one task or goal requiring our attention was left untouched. We have a fleeting thought that one day it will get done. The challenge is to stop and make a sincere effort to begin the process of tackling that goal. It may be one of your important goals.